(KZN.RU, February 5, Ksenia Shvetsova). Ilsur Metshin, the Mayor of Kazan, visited the MUP “PATP №4”. He assessed the condition of the rolling stock of one of the oldest transport enterprises in the city and got acquainted with the working conditions of the staff. As it turned out, old buses that have worked on Kazan roads for ten years are in demand in other cities. Passenger motor company №4 (Rus. “PATP”), established in 1962, is today one of the largest in Kazan. Almost a quarter of passengers (22.5%) use its services, and the PATP route network covers all areas of the city. The company has 21 bus routes, including 19 urban and 2 seasonal specials. In a month, the number PATP №4 carries about 4.9 million people or 163 thousand passengers per day. The head of the city examined the rolling stock. Airat Iskhakov, the director of the MUP “PATP №4”, said that the total number of the company's rolling stock is 247 units. PATP is constantly working on updating the fleet. Last year, 40 large capacity buses of the MAZ brand and 37 buses of the NefAZ brand running on gas engine fuel were purchased. “The company has been updated for the World Cup. The average age of buses in the city is 3.5 years, and at this enterprise, it is 3 years”, explained Aidar Abdulkhakov, the chairman of the Committee on Transport. Along with the replenishment of the fleet with gas-engine buses last year, new equipment was purchased for its maintenance. Thus, PATP purchased a degassing post. As A. Ishkhakov explained, before arriving at the diagnostics, the bus must necessarily bleed the gas from all the cylinders, leaving the fuel only for moving to the required spot. “We have 130 buses that were purchased in 2012. In 2022, they will be 10 years old and will have to be replaced, too”, said A. Iskhakov. “How long lifetime mileage they have? A million kilometers?” asked Ilsur Metshin. “Just by the age of 10, they will come close to this indicator. We will leave a few buses as “donors” for repairing other cars, and most of them will gradually be put up for sale in other cities. We have already been contacted from Chelyabinsk”, noted the head of the PATP. I. Metshin also inspected the diagnostic section, where licensed vehicle inspection is carried out. Having received the opinion of experts, a driver overtakes the bus to the maintenance area, where it will be repaired according to the diagnosis. The head of the city asked if the buses pass inspection on a daily basis. “A control examination is carried out every morning”, explained A. Iskhakov. “The percentage of usage of the fleet in our company is quite good – this morning it was 93%”. “The most important thing is that you have high-quality rolling stock. The company employs good people dedicated to their work. Many drivers have been working for more than 10 years. A good repair shop, and in general, the state of the enterprise suggests that we can continue to be confident in the public transport of the city”, said I. Metshin. Today, the company employs more than 900 people: 430 bus drivers, 136 conductors, as well as repair and support staff. According to A. Iskhakov, the company lacks conductors and about 100 drivers. This problem will be partly solved by the increase in the fare. From February 3, in Kazan, the fare in public transport increases by 2 rubles. “Due to the increase in the fare, we will have enough funds to pay leasing payments. This year they increased by 100 million rubles compared to last year due to the renewal of rolling stock. And it will also allow us to employ about 20-30 drivers in order to partially eliminate the need of the enterprise”, said the director of the PATP. The Mayor also inspected the control room, the room in which the validators are stored, the physical room and the medical wing. In the latter, PATP employees can receive the help of a therapist, a dentist, emergency care, take a cardiogram and an x-ray. Today, the transport industry in Kazan is of a great importance, said I. Metshin. “We do everything we can. Now it’s time for the quality of passenger service: the attitude of the drivers, the speed limit so that there are no accidents. This is what we have to work out together. The culture and quality of passenger service of public transport is today the number one question. We managed to realize everything else over the years”, said the Mayor and wished success to the company's employees. 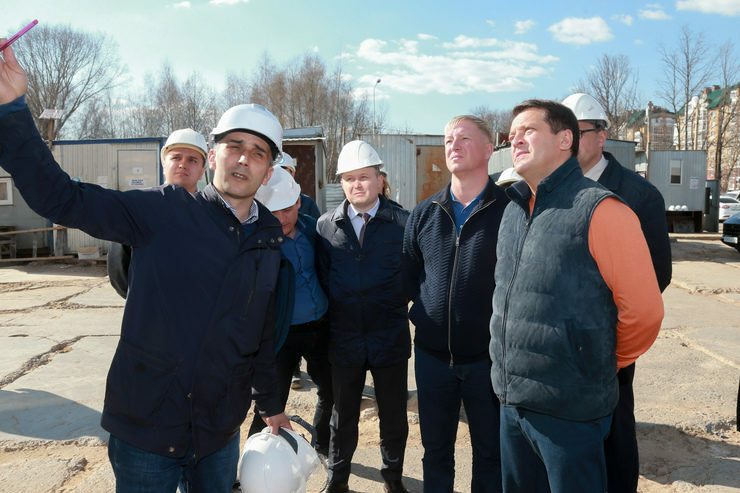 Ildar Shakirov, the deputy head of the Executive Committee, Sergey Mironov, the head of the Kirovsky and Moskovsky districts’ administration, took part in the inspection of the enterprise.